Keith Price's Curtain Call: EXTREME THEATER, BABY!!!! If you happen to follow my Instagram page, you will notice that from time to time, I get the privilege of getting to see shows and the opportunity to share my thoughts and recommendations. I have considered myself primarily an Ambassador to Theater. I want people to see as much live performance as they can, and quite frankly in as many disciplines of performance as they can. I know that as an Ambassador to Theater, and with such a wide gap between content, presentation, and tone, I would never dare tell anyone what they "should" see. In any case, when I am asked about a recommendation of what to see, I think about how much it costs to see a show. I ask about what someone's interests are: comedy vs. drama, or musical vs. play. I love to give everything a fair shot, mostly because I get to see more than the average theater goer. I recognize that most people are not that fortunate, therefore they must make more informed choices with their theater dollars. Last week, I had the chance to see 2 wildly different shows. 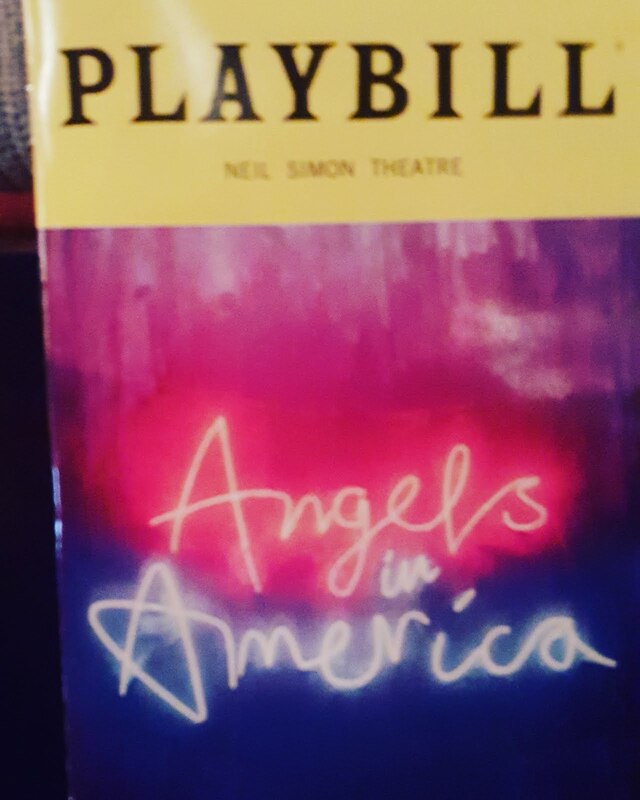 The impact of one show left me exhilarated and exhausted as it took me on the epic and emotional, theatrical roller coaster ride that is the The National Theatre's revival of Tony Kushner's masterpiece, Angels in America, starring Nathan Lane, Andrew Garfield, Lee Pace, Susan Brown, Denise Gough, James McArdle, Nathan Stewart-Jarrett, and Amanda Lawrence. Although the show has gone on to become a multiple Emmy Award Winning HBO miniseries, there is still something special that being in the theater when all of that art, intensity of story, and stage magic combine and create something so unique. 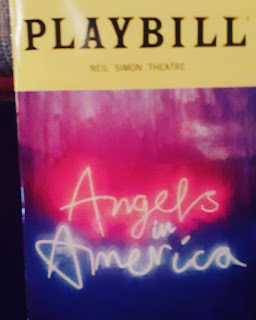 Now this is not the type of presentation that is for everyone, but for the patient, brilliant acting, serious subject matter fans, you better hurry to the Neil Simon Theater for what is probably one of the most epic things that I have witnessed in a few seasons. You have 2 ways to witness both parts (Millennium Approaches and Perestroika), either on 2 different nights, or in an epic Matinee + Evening Show Combination. That was the combination that I chose. It is the height of audience and artist sharing and being there for each other. I know this will sound ridiculous, but it was like I clocked in at 1pm with those actors and literally spent the day at work with them until we ALL clocked at almost 11pm. It was like "take your theater geek to work" Day, and for the record, those folks WERKED!!!! So if this speaks to you on any level, then go to https://angelsbroadway.com/ for more information about the cast and how to get tickets for this limited run event. The impact of the other show left me in the mood not only for a fruity cocktail and a beach vacation, but a strong sense of needing to relax and just get over myself. 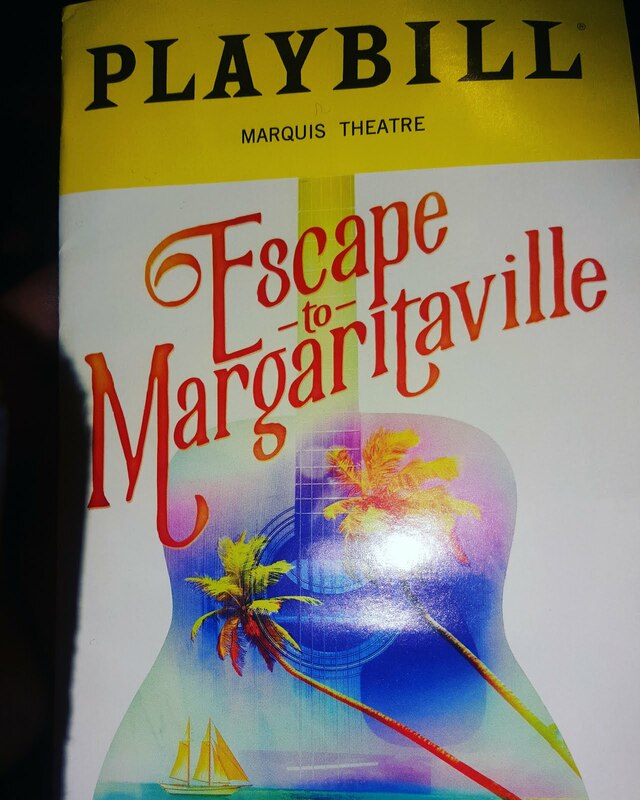 Escape to Margaritaville is that show. It features some of Broadway's phenomenal talent: Paul Anthony Nolan (BRIGHT STAR, ONCE) , Lisa Howard (25th ANNUAL PUTNAM COUNTY SPELLING BEE, IT SHOULD'VE BEEN YOU) , Rema Webb (THE COLOR PURPLE, THE LION KING, BOOK OF MORMON, A NEW BRAIN), Alison Luff (LES MISERABLES, SCANDALOUS, MAMA MIA) Eric Petersen ( SCHOOL OF ROCK, PETER AND THE STAR CATCHER). This cast takes the music and lyrics of Jimmy Buffet, the book written by Mike O'Malley and Greg Garcia, Kelly Devine's choreography and Tony Award Winning Christopher Ashley's direction ( COME FROM AWAY), and just have fun. That's it. 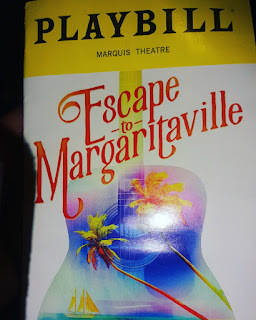 I have to admit that when I heard that this show was coming to Broadway, I said the thing that EVERY person who has a little theater snobbery within them said, "Jimmy Buffet on Broadway? Really?" But as I sat in the Marriott Marquis Theater, I learned something. This show is the perfect antidote to what has been an insane real world. Yes, the story may not be the most daring ever told. The music may cause your neighbor to sing along before the cast says it's okay to sing along with them. To be honest, any musical that gives me a tap number, no matter how odd the placement, still gives me a little tingle, if not insane bursts of joy, because when I think of Jimmy Buffet music, tap dancing does not quickly come to mind. However, I had the realization that this show serves an audience that does not need to have their core beliefs challenged. They just want to be entertained. Anyone who says otherwise without seeing the show first, is working too hard to be a contrarian. Go out and see a show. Go to http://escapetomargaritavillemusical.com/ for more information and tickets.